Reintroduced. Widely scattered breeder. About 1,500 birds in the state. The bill is all black with no knob at the upper base and no yellow lores. Mute Swan (Cygnus olor) bill is orange with a black knob at the upper base. It is a rare vagrant in eastern Minnesota. Tundra Swan (Cygnus columbianus) is smaller and usually has yellow lores. It is much more common and widespread. Small patches of skin between a bird’s eye and bill, one below each eye. Pair of Trumpeters, Geese, 2 distant wood ducks and a pair of Sandhill Cranes across the water. Seen them today in rural Norman Co. Mn. One is standing on one leg…resting the other I am thinking. Most of these shots are taken in the old Twin Cities Army Ammunition Plant around Lake Marsden. A blog for smart people. Stupid people will probably get a headache reading here (unless they stick to the flickr links...pretty pictures). The Trumpeter Swans have, and continue to make a comeback after nearly being hunted to extinction by the early 1900's. Large beautiful birds they can sometimes be quite vocal to each other. No idea what they were saying, but they obviously understand one another. Wind made it difficult filming at times. Nearly hunted to extinction by the early 1900's the Trumpeter Swan has made quite a comeback and I am glad they have. This brief video shows the Trumpeter Swans existing in their natural habitat along with ducks and geese etc. with a combination of natural swan sounds as well as instrumental music in areas. This is the first HD video of this type I have done using a DSLR camera with a 55-250mm zoom lens instead of a HD camcorder. 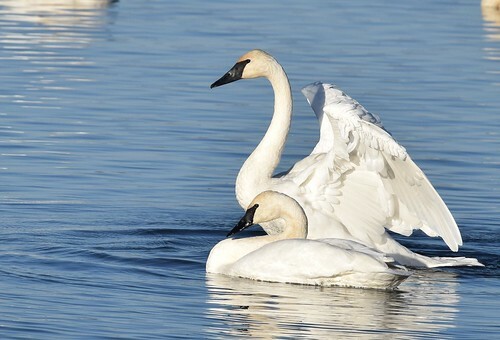 Get more at http://animal.discovery.com/videos/ Trumpeter Swan dads are loyal to their families, mating for life with the mother swans. I have never heard anything like this. Birds can actually sound like a brass instrument. Trumpeter swans are much larger than any other species of waterfowl. Adult trumpeters will average about 30 pounds and have a seven foot wing span. Young swans, called cygnets, are easy to identify, because they're gray, not white, until they're a year old. Hunting in the 1800s drove trumpeter swans to the brink of extinction. Restoration efforts in the upper Midwest have led to increased sightings of swans in Missouri as they migrate through during fall and winter months. 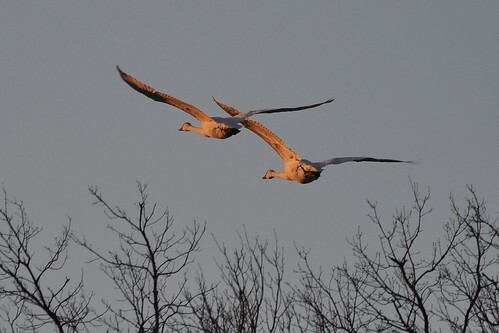 And several trumpeter families have been found wintering in different areas around Missouri. But until people get used to seeing them, waterfowl hunters need to be careful. Shooting a protected trumpeter swan can cost thousands of dollars in fines. 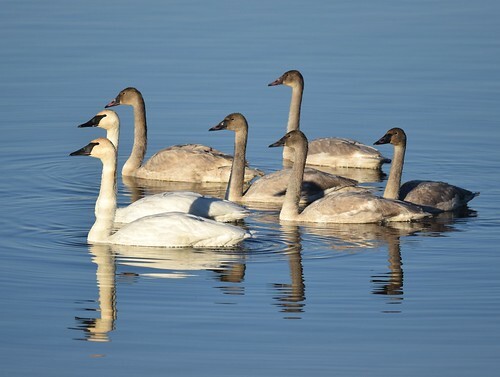 Thanks to the efforts of volunteers with the Trumpeter Swan Restoration project, the endangered trumpeter swan population in Ontario is now over 1,000. Long time volunteers Harry Lumsden, Beverly and Ray Kingdon feed the swans at Lasalle Park in Burlington. See thestar.com for more news and information. At a tiny lake in northwestern Washington State, hundreds of wintering trumpeter swans rest every night (between December and early March) and fly out from the lake at dawn to feed in nearby farm fields. This is Shadow Lake at the Bob Heirman Wildlife Preserve in Snohomish County, and these trumpeter swans are part of the Pacific Coast population that breeds during summers in the interior of Alaska and spends winters along the Pacific Coast as far south as Eugene, Oregon. Trumpeter swans are the largest waterfowl in North America. Unfortunately they were hunted nearly to extinction in the 1600s-1800s. Their long wing feathers were prized as elegant quill pens, and their skins were used to make cosmetic powder puffs. Please help protect these lovely, graceful birds by never using lead shot for hunting or for target practice. Use only NONTOXIC shot (such as stainless steel), and ask your friends to do the same. 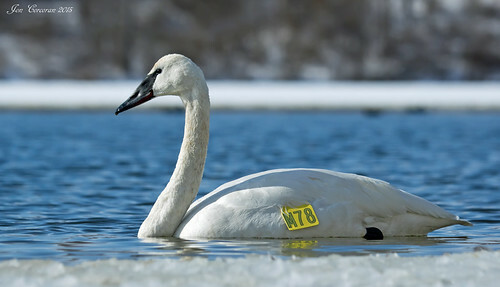 For more information about trumpeter swans, please visit www.trumpeterswansociety.org. Please visit my beautiful photography website http://www.wildnwbeauty.com and my Facebook page http://www.facebook.com/WildNWBeauty for incredible high-resolution photographs of the majestic wild scenery and wildlife of the Pacific Northwest! You can find the music of Rho at http://full-source.com/nosource/netlabel/artists_rho.htm. Location: rural Norman Co, Mn. Today (April 2, 2018) the water has froze there is a also a little more snow and they have gone elsewhere. One is standing on one leg…resting the other I am thinking. I tried to use the noise of the planes landing to cover the sound of my approach, but they became aware of me soon enough and gave a few warning honks. Still, I was able to approach slowly and get to about 30 yards from them. When I sat still to watch, they would tuck their heads back under their wings, but as soon as I started moving they perked up again.